Place the medium pot on the hob and turn to a high heat. Add the oil and garlic and leave to cook for one minute. Before the garlic browns, add in the prawns and stir. Cook for one minute and add the chilli flakes. Allow it to bubble, cover, and leave for a few minutes, shaking the pan occasionally. When the prawns are cooked remove form the heat. Cut the lime into wedges. Transfer the prawns onto a serving plate and season with salt and pepper. 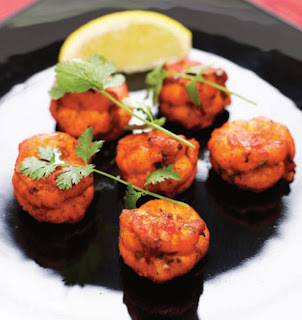 Sprinkle over the coriander leaves and add a drizzle of lime juice and oil. Garnish with the lime wedges and serve.